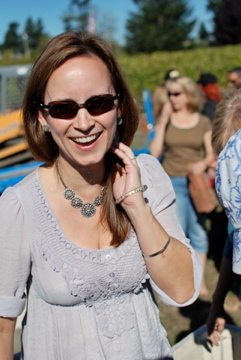 Concluding my Celebration of Bloggers Tour is Julie Valerie, founder of Chick Lit Chit Chat on www.julievalerie.com. I introduced myself to Julie when I heard that she planned to read and review a chick lit book a week during 2013. Being a chick lit author, I immediately reached out to Julie and asked if she wanted to review A State of Jane. At the time, I had no idea that I would actually meet Julie just a few months later when she volunteered to help out at the Book Buzz author event I co-organized with several other authors in New York City. Julie’s assistance that day was invaluable. As you will see from her blog post below, Julie has such a great sense of humor. She’s a whole lot of fun and I truly cannot wait until her debut novel is released so that I can return some of the support she has generously bestowed onto me and so many other authors. She’s really an amazing person and I like her so much, even more than…bacon! Since this is a post about blogging, I’m going to stay on topic and talk about blogging. Not bacon. It’s cool because it’s both private and public at the same time. It’s something you do from the privacy of your home, but once done, instantly travels the globe. And blogging offers some real benefits. Two, through blogging, you can share your talents and expertise with others and they can share their specialties with you. Bacon? Not so much. It can’t talk back. Three, in my case, as a book blogger, blogging is the perfect platform for celebrating the arrival of a new book, or talking about an old book in a new way. Now I ask you: What’s better than that? Now, don’t get me wrong, I love bacon. Almost as much as I love blogging. But bacon can’t help you market or promote things that are important to you. It just sits there. On your plate. Being bacon-y. Bacon doesn’t let you demonstrate what you know about a topic. Bacon doesn’t help you establish yourself in a field. Bacon doesn’t network. It doesn’t make connections. It can’t link, like, tweet, post or comment. And that’s why, on the list of things I love, blogging comes before bacon. With one exception: Every morning, when I’m still half asleep and oh, so hungry? P.S. Meredith, thanks so much for inviting me to be a part of the Celebrating Bloggers Tour to help kick off your August 28 release of Blogger Girl. I can’t wait to read all about Kimberly Long and her “Pastel is the New Black” blog. I know she (like me) has loved chick lit since the first time she read Bridget Jones’s Diary. And I know I’ll feel like Kimberly is a kindred spirit when I’m reading her because I have an entire category on my blog that’s dedicated a re-reading of Bridget Jones’s Diary, that watershed book that catapulted modern chick lit into the hearts and minds of readers. Cheers to you and Kimberly! Yay for Blogger Girl!